Now, tha's what i wish to have for my Nokia too. This is really something very useful. We have seen lot of cases for iPhone, but this one is the winner in the useful category. 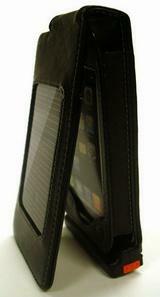 The case is aleather cas with a special cover with solar cells. The case contains an own Li-Ion battery as well. It needs 12 hours to charge a totally exhausted iPhone when the own battery is also exhausted. If own battery is charged it needs 3 hrs - the manufacturer says. Good, that you charge the case without the iPhone.